Cheese is produced by adding enzymes to milk. These enzymes cause the milk to separate into curds and whey (solids and liquid). The curds form the basis of all real cheeses, from cottage cheese to Parmesan and Gorgonzola. Processed cheese is real cheese that has been mixed and heated with emulsifying salts, a process that creates a uniform, smooth, easy-melting mass. Processed cheese food is a type of processed cheese. 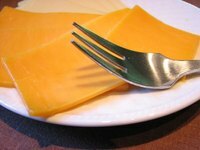 Processed cheese was invented in 1911 by the Swiss, who wanted to export cheese to countries with warmer climates. The United States issued its first patent for processed cheese to James Lewis Kraft in 1916. Pasteurized process cheese, cheese food, cheese spread and cheese product are all USDA classifications for processed cheese. Process cheese food and cheese spread contain more moisture and less fat than process cheese and regular cheese. They may also contain ingredients that the USDA prohibits in process cheese. Process cheese product doesn’t meet the criteria for the other categories. For example, it isn’t required to contain a certain amount of fat or moisture. Pasteurized process cheese food tends be cheaper and to have a longer shelf life. It has a consistent quality and flavor, melts well, and can be used in many packaged foods. Processed cheeses and the foods made with them often contain undesirable ingredients, such as preservatives or other additives.